One-man-band Eskil Steenberg's procedurally generated indie MMOG Love will be hitting open beta this week for everyone to try to see what the hell it's all about. What do you mean you've never heard of Love? Shame on you! 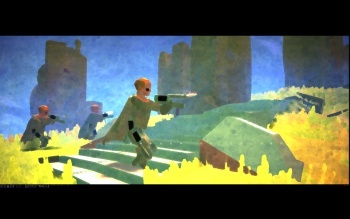 Love is a pseudo-Massive multiplayer shooter set in a watercolor, impressionistic world - a world that is all procedurally generated every time you play. It's even more impressive when you consider that it's the one-man work of programming genius Eskil Steenberg, a man who knows what game he wants to make and has built the tools to make it. The game has thus far been in closed beta and alpha states, but Steenberg is ready to open it up to everybody as of January 7th. As Steenberg is hardly a massive company like Blizzard or SOE, all he's asking in return is that people help defray his bandwidth costs, so if you want to get in on the beta it'll cost you €3 ($4.33) for 30 days. For all I've been "Wow, that's a really cool idea" about Love, I actually know very little about how the actual game, y'know, plays - and Steenberg does not mince words: The game will not hold your hand as you get used to it. "Love is a very different game, and not one that is easy to get in to. Its a game that's most people start to appreciate over time. There is no hand-holding, no glowing arrows, no female voice telling you what to do, and no quests. In many ways Its an old school PC game, that takes a bit of time getting used to. Evaluation of games are always tricky, and with a game so different its sometimes hard to know if something is broken, just different or something you haven't figured out yet." His recommendation? Talk to more experienced players and check out player-run resources like Love In Verses. So if you're looking at falling into Love, heed his advice.